The health benefits of drinking water are well known, and it is especially important for cancer patients and survivors to drink lots of water – to flush out toxins and keep your kidneys in good function. In the summer months, as we lose water through perspiration and dehydration, it is especially important to take in more water than we lose. 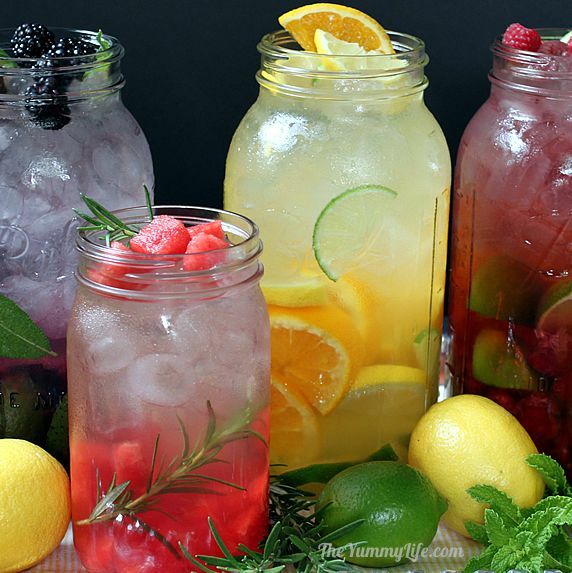 Here is a great and easy way to drink water that’s delicious, and also infinitely healthier than drinking sodas or bottled concoctions with added sugar, while taking advantage of summer fruits that are in peak season. Birds, bees and other critters like chipmunks and squirrels need water in this heat as much as we do. I have a birdbath, and I also set water out in a clay or plastic planter tray closer to the earth. If you keep it clean, and change it frequently – daily if possible, you’ll see them out there all summer long. I also made a pretty watering place for the bees. Mine is made from a crystal egg dish with a crystal flower frog set inside, so they can perch on it. If the water is too deep it’s tough for them to be able to drink without drowning. These can be found at garage sales or thrift stores, since nobody seems to use them anymore. You could also use glass marbles in a dish or tray and set it on a plant stand in the garden. I also share a little fruit with the neighborhood animal life in my backyard– especially if it’s overripe and marked down at the farmer’s market. Many species of birds enjoy fruits like nectarines, apples, peaches, any type of berry, oranges, plums, etc. I’m still waiting for an Oriole, but I do have several Grey Catbirds and Blue Jays so far. The chipmunks and squirrels love fruit too so I toss these on the ground so they’ll leave some for the birds. Overripe bananas are a treat for chipmunks, and how many bananas can you save in your freezer for smoothies after all? Also, you haven’t lived until you’ve seen a chipmunk carry a whole cherry in her mouth back to her burrow! If there is any fruit left over, and it’s allowed to rot, you’ll see butterflies coming to drink the nectar. I made my own feeder out of a plastic tray that I drilled holes in and hung with fishing wire from a shepherd’s hook near the bird feeder. It took about 15 minutes to make. Tray and suet cage feeders are also available and work well for this purpose, but it is fun, and more economical to make your own if you have the time and desire for it. Hydrate and care for yourself and your habitat this summer. I have personally found this to be an extra gratifying way to enjoy the gift of summer. Previous Previous post: Happy Eating! Next Next post: All Hail Kale & This Yummy Salad Recipe!